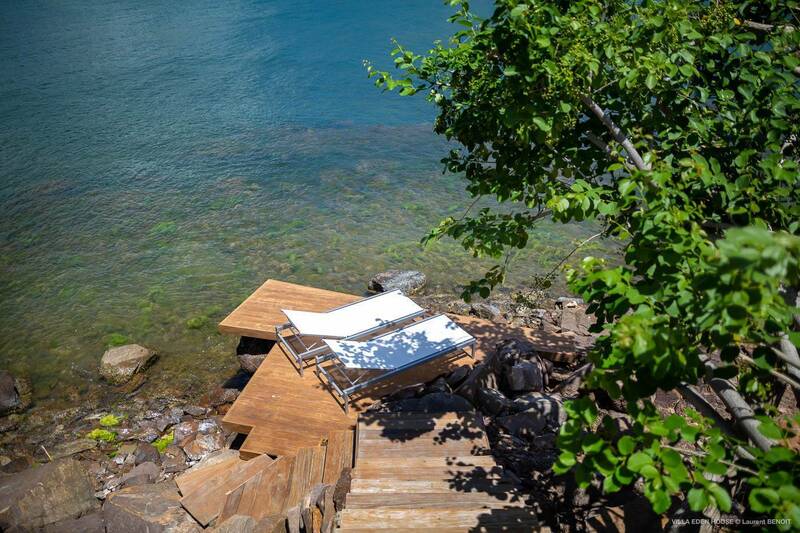 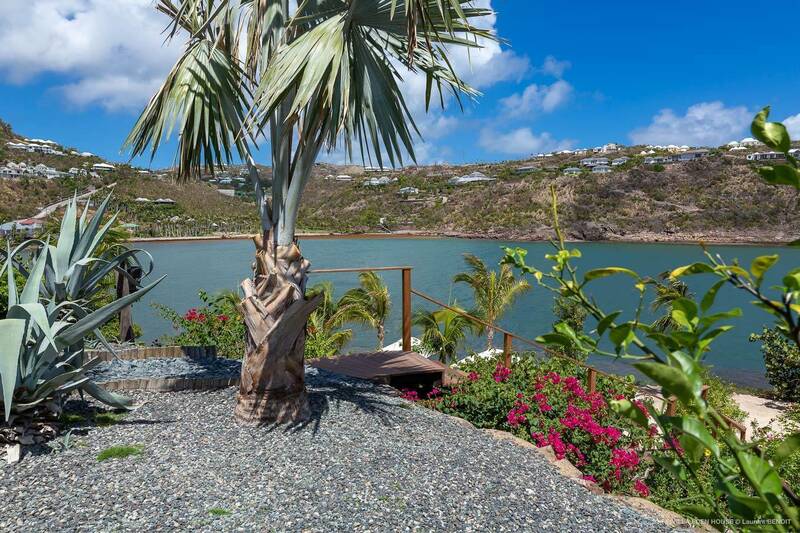 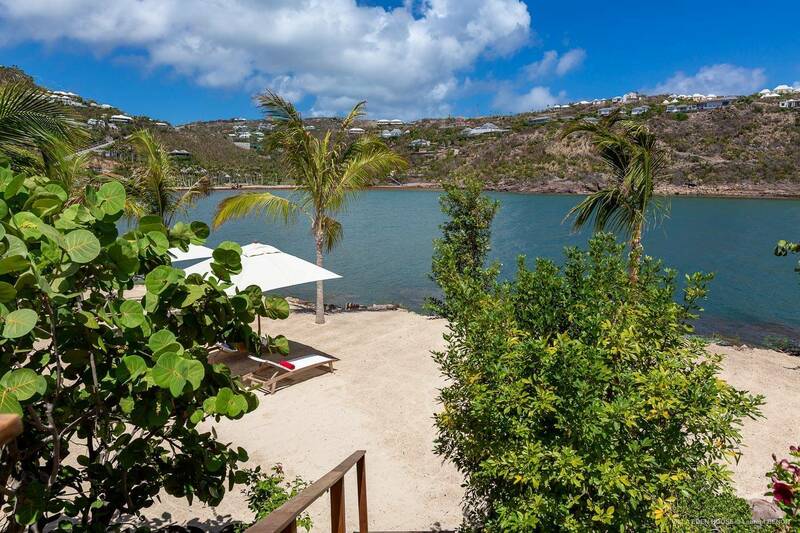 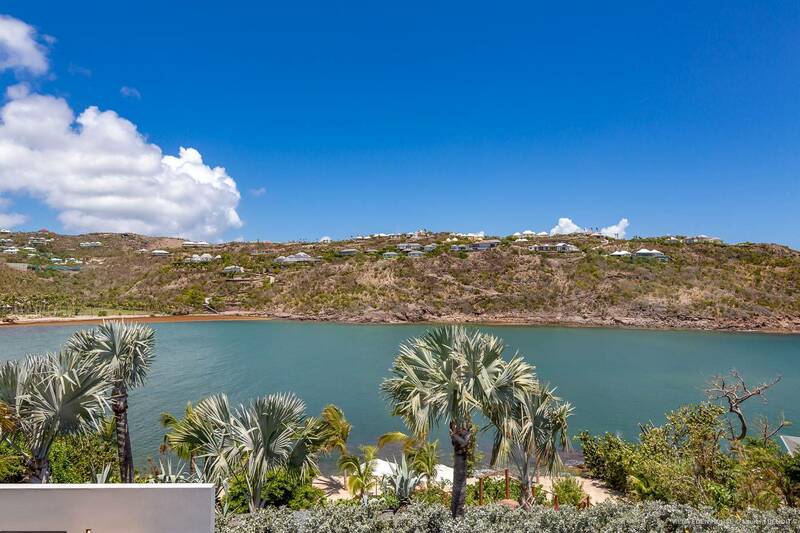 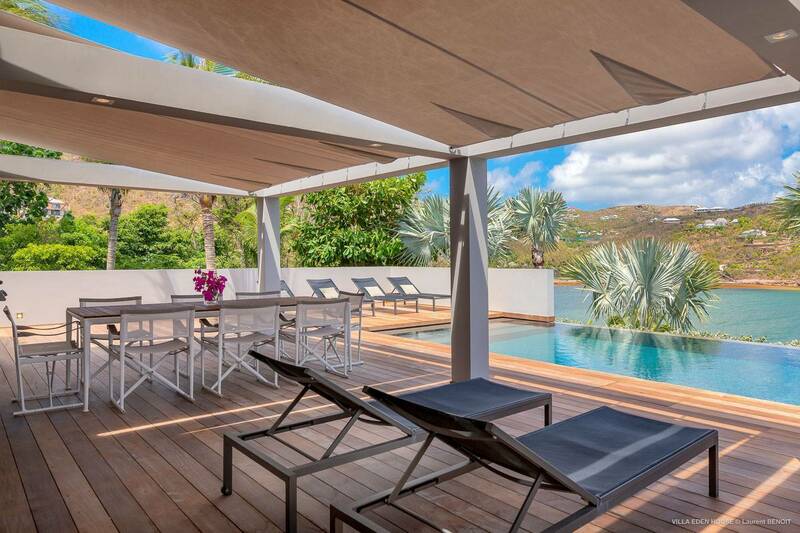 Dream About: Vacationing in a peaceful and private villa on Marigot Bay’s waterfront. 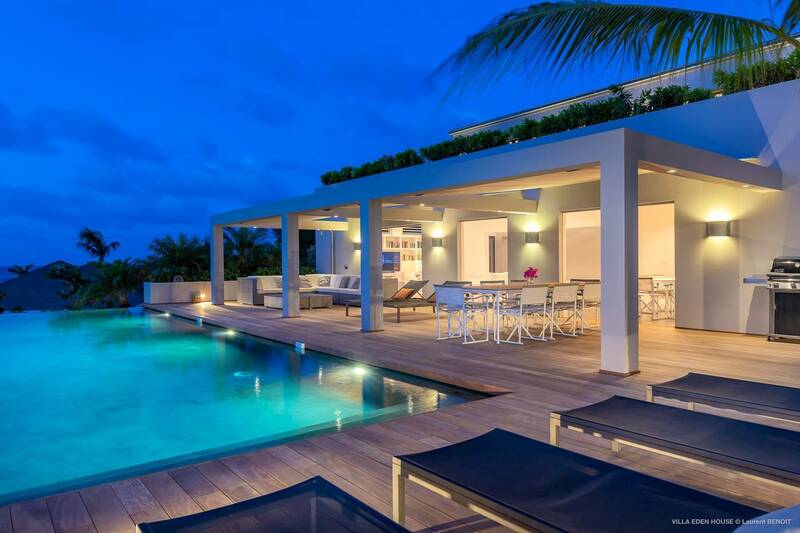 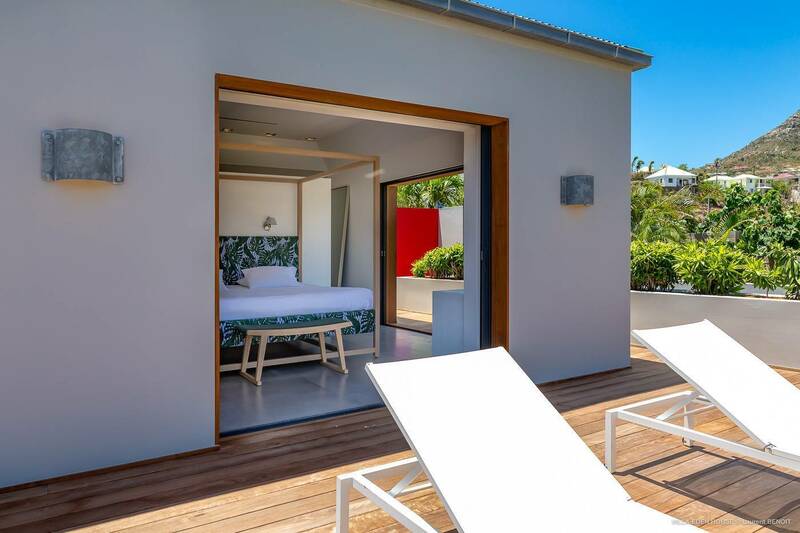 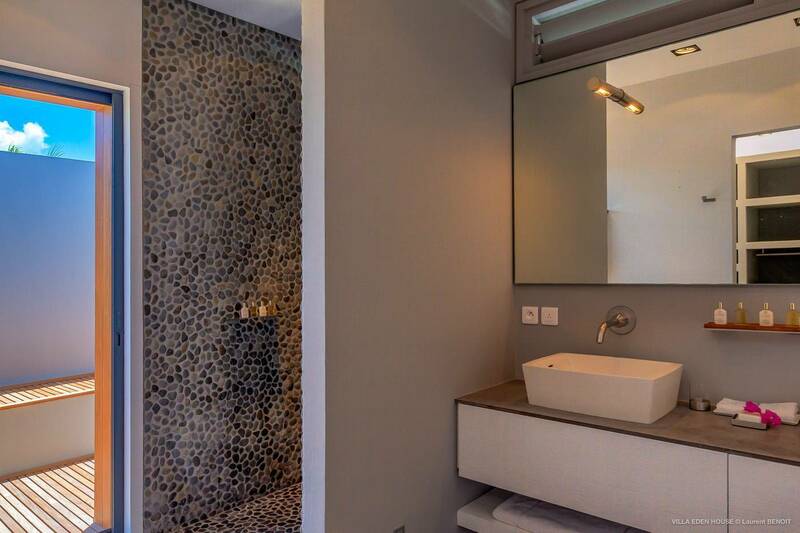 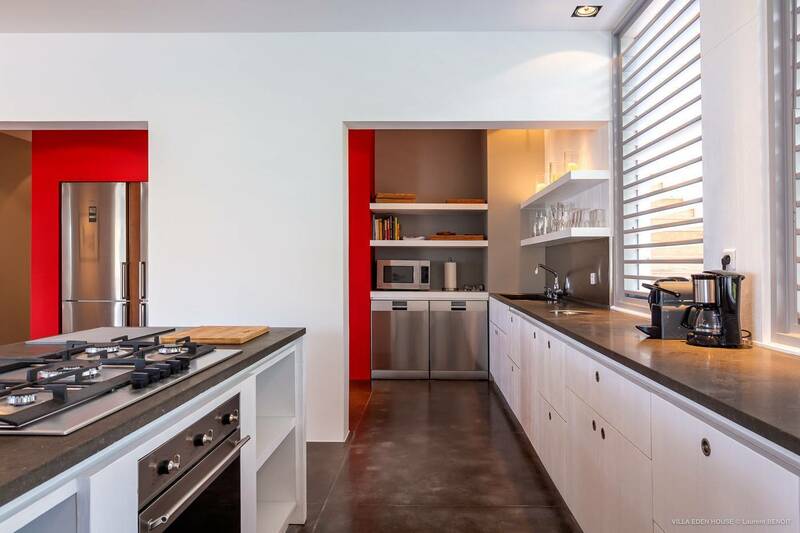 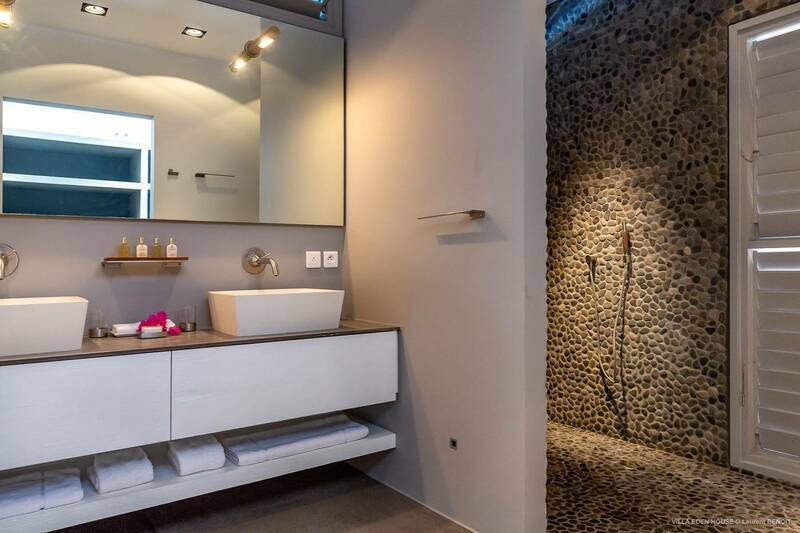 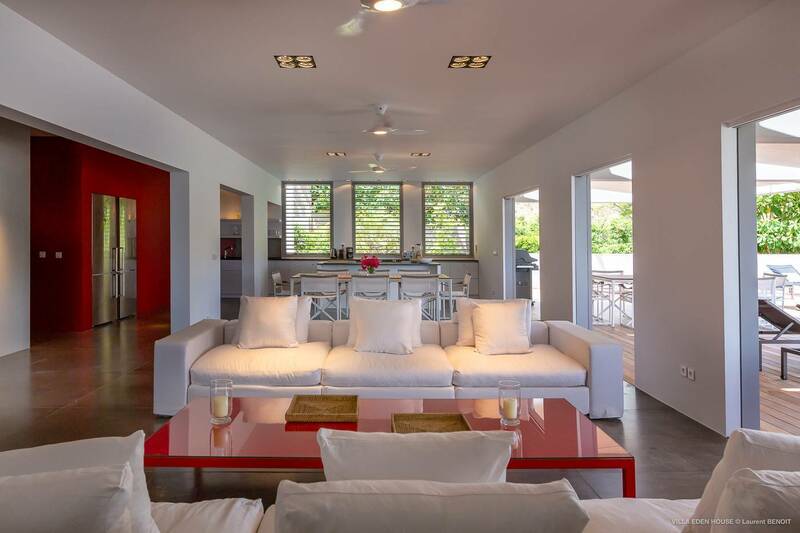 Chic and contemporary, this 3 bedroom villa’s architectural design is complemented by high-quality natural finishes and a minimalist décor with a bit of Italian flair. 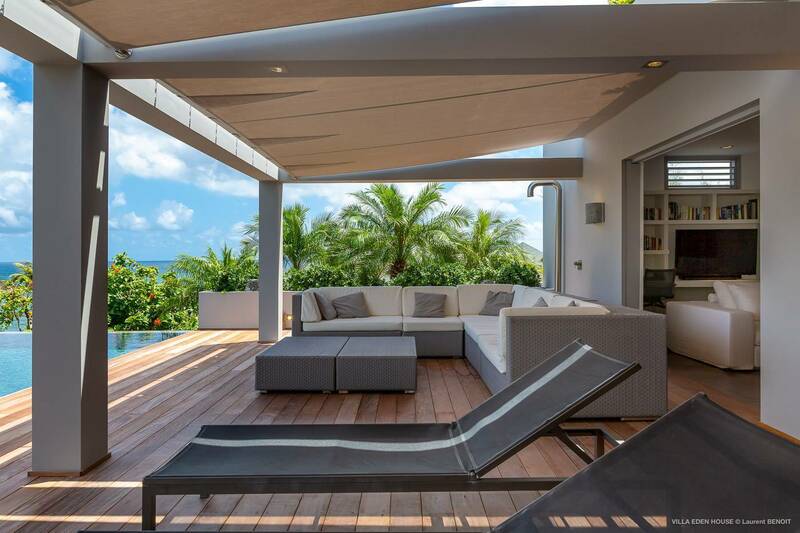 Its soothing gray color palette is accented with pops of bright tropical colors. 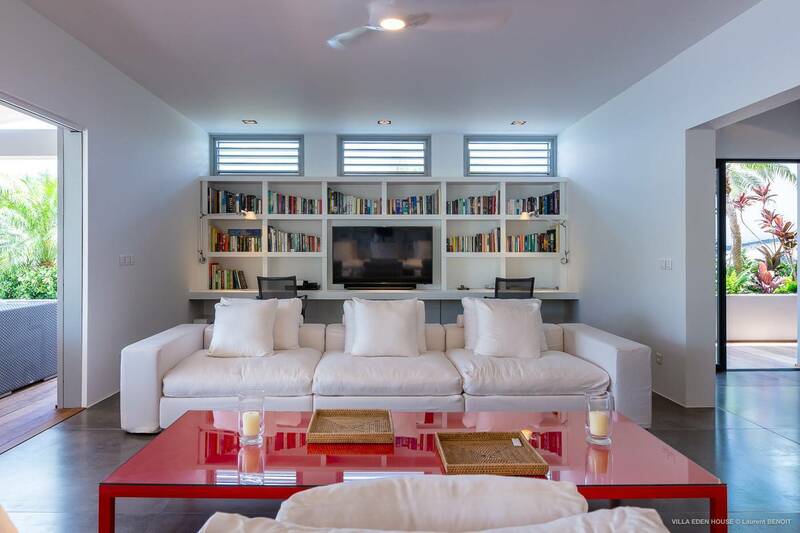 The spacious living room is ideal for relaxing and a foodie’s dream of a kitchen is outfitted with top-of-the-line appliances. 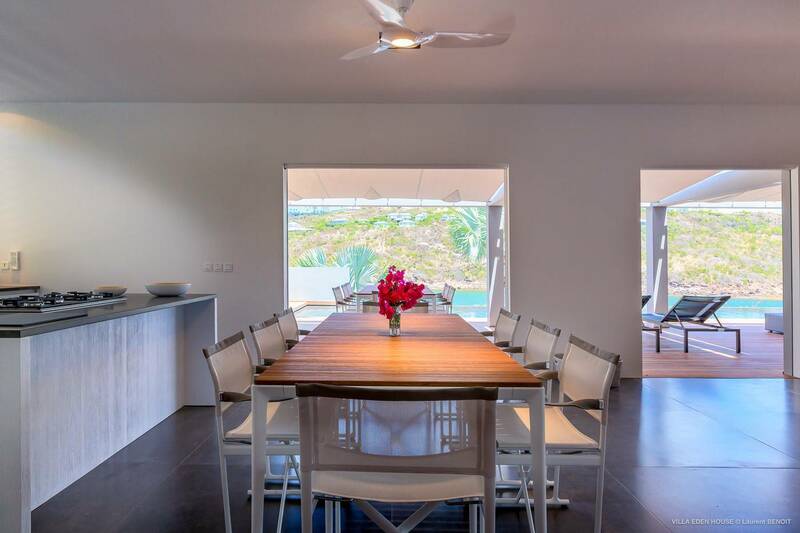 Dining can be enjoyed indoors or alfresco on a covered terrace. 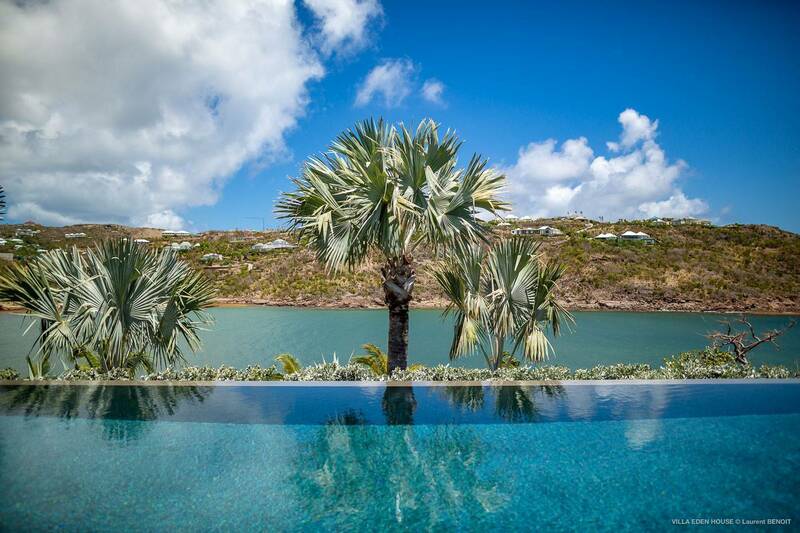 An oversized infinity pool is the focal point of the huge deck furnished for outdoor living and in the evening, guests enjoy the view of the twinkling lights of the Mont Jean villas emanating from across the bay. 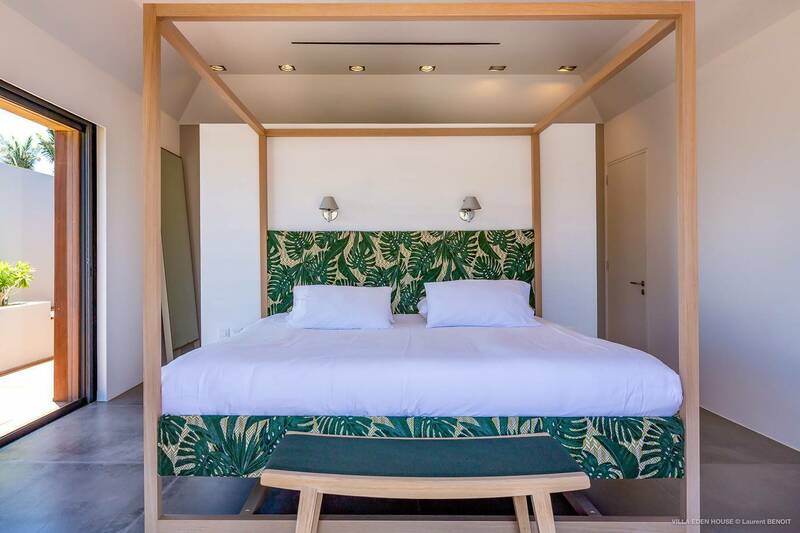 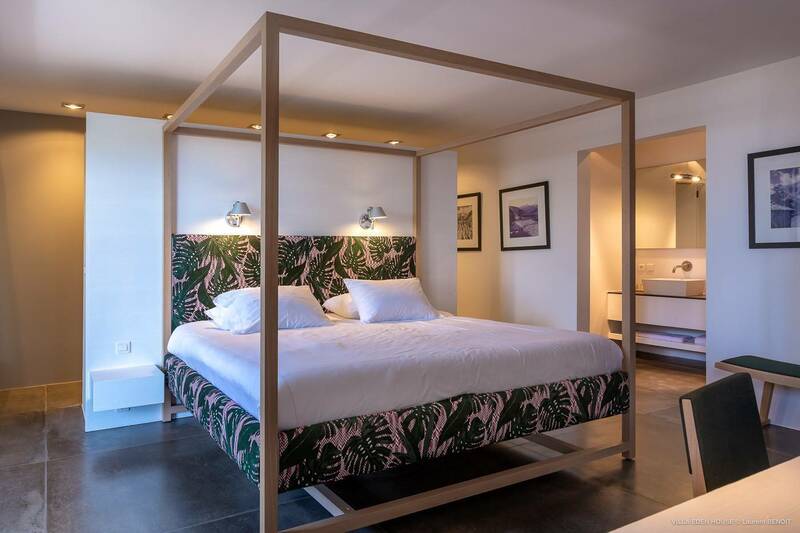 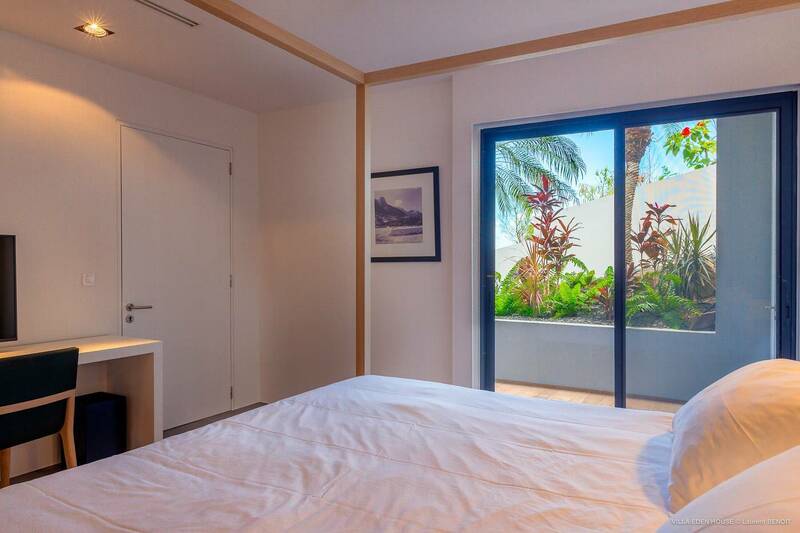 Three equally-sized bedrooms are distinguished by different vibrant color schemes and feature 4 poster king beds, beautifully appointed en suite baths and walk-in closets. 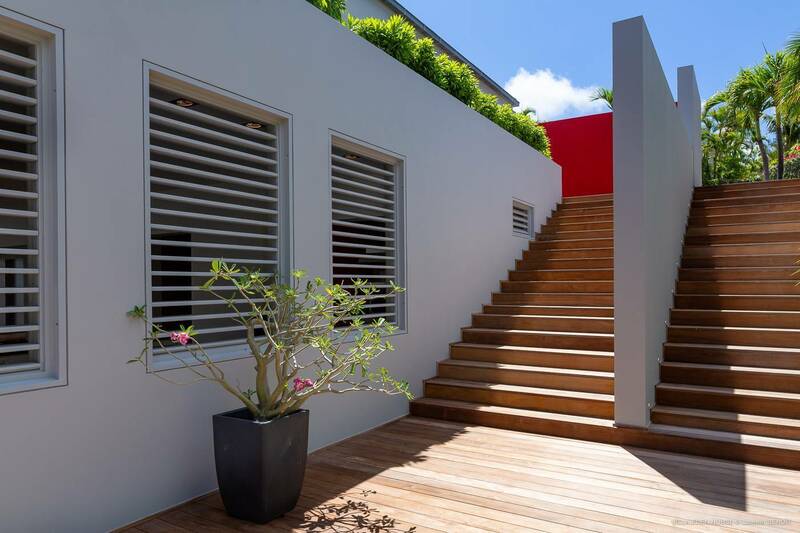 One is downstairs and two are situated upstairs and can be accessed both directly from the parking area and an external staircase. 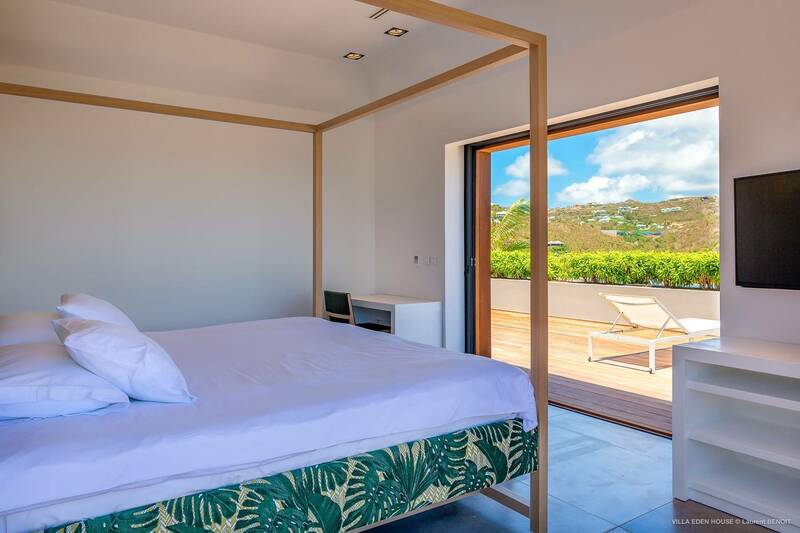 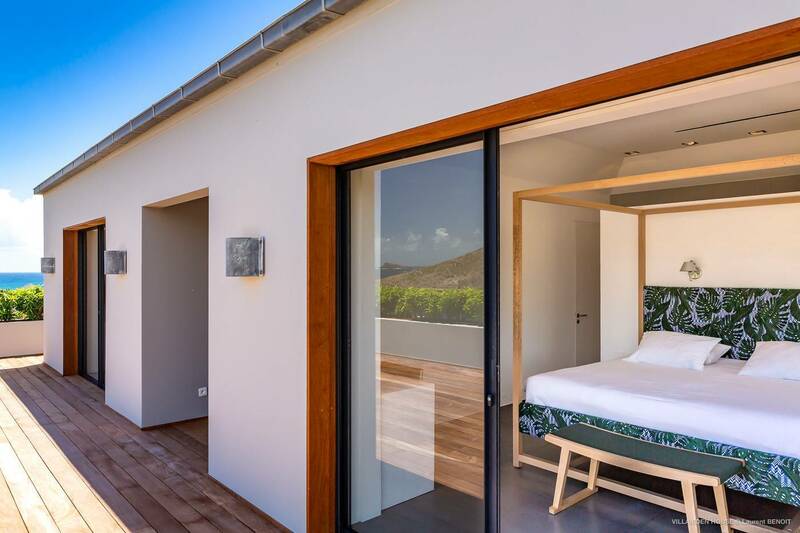 The upper-level bedrooms share a terrace and the view is lovely. 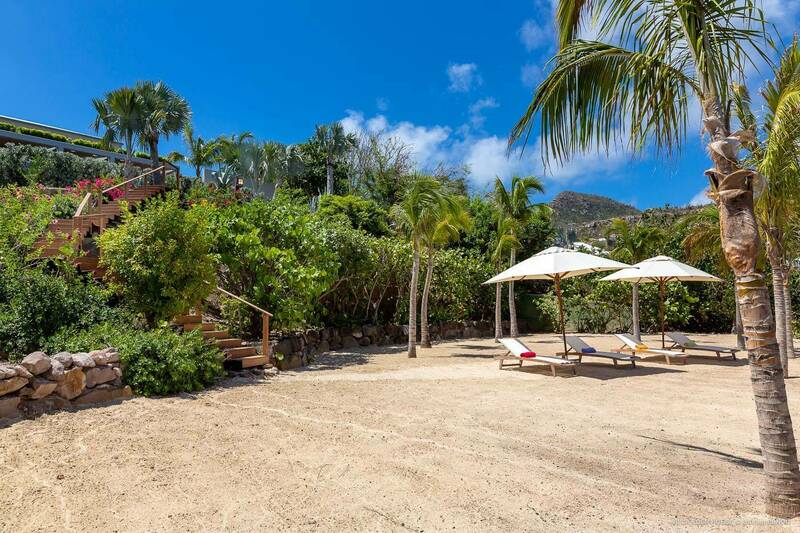 Tropical gardens and a coconut grove enhance the ambience, and access to snorkeling is available via a steep stairway. 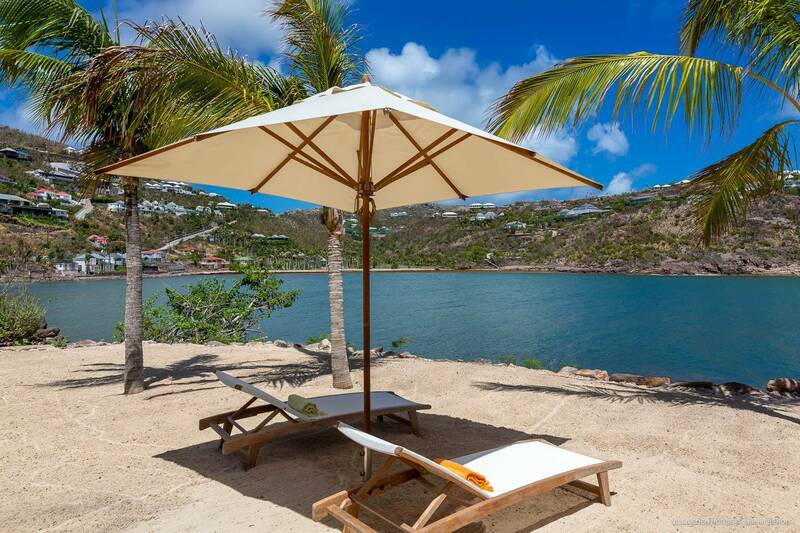 For guests who want to take a short walk to the beach, Villa Sophia’s Marigot location provides access to Marechal Beach via Le Guanahani and the hotel's bar, restaurants and spa. 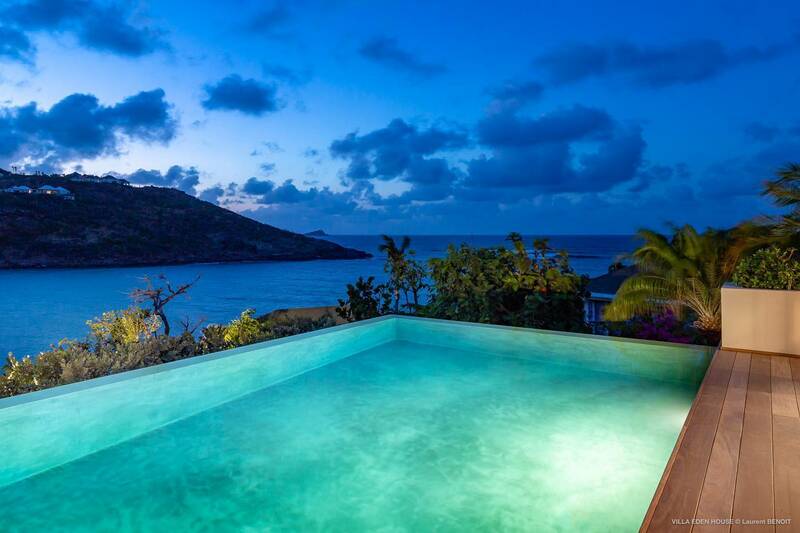 The gentle sounds of the waves crossing over the reef of Marigot Bay. 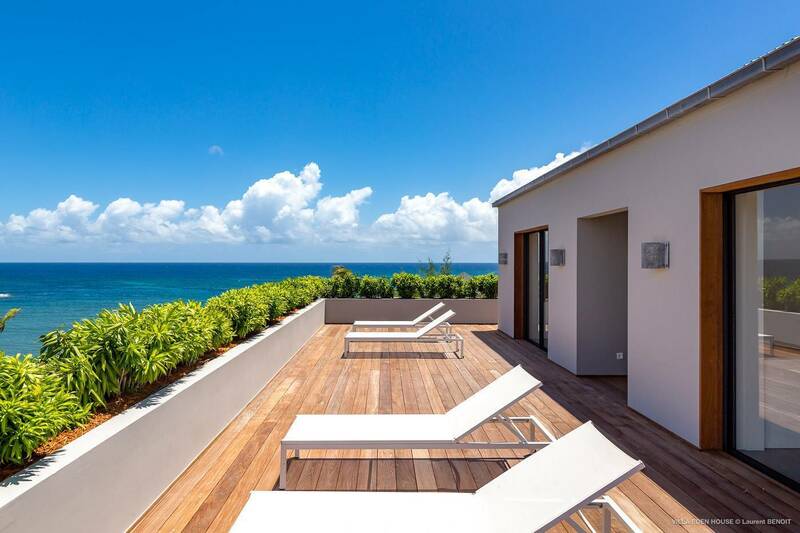 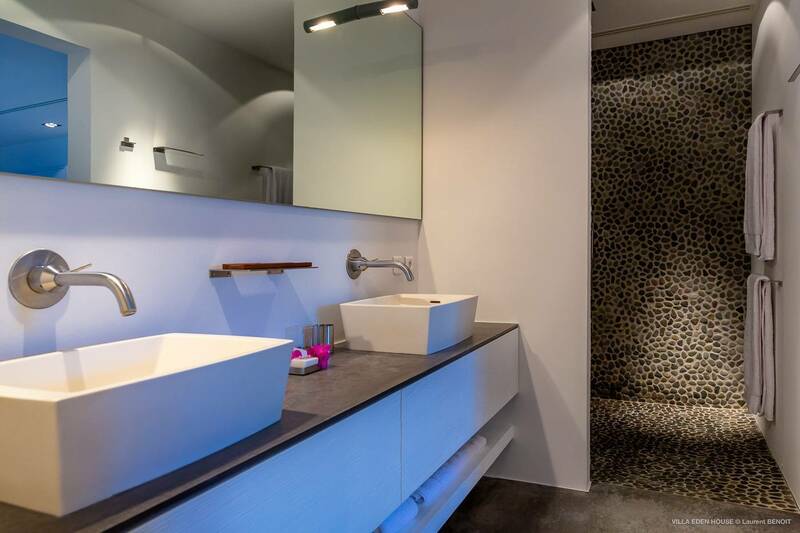 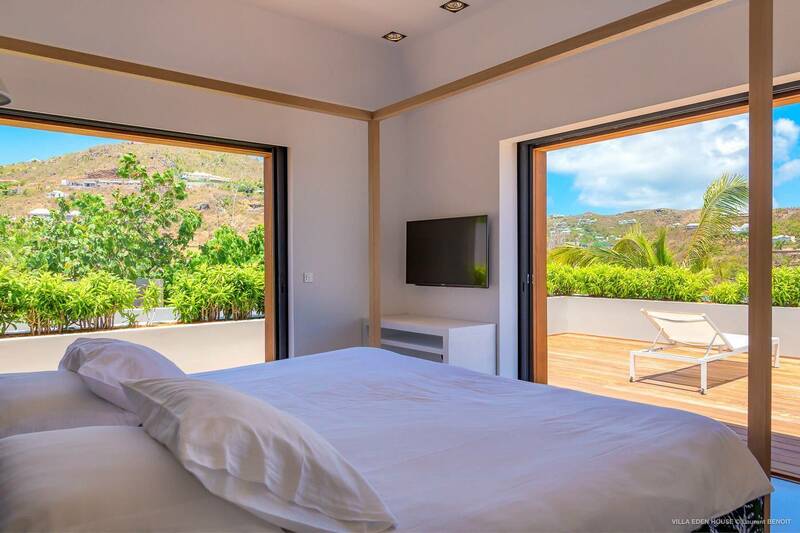 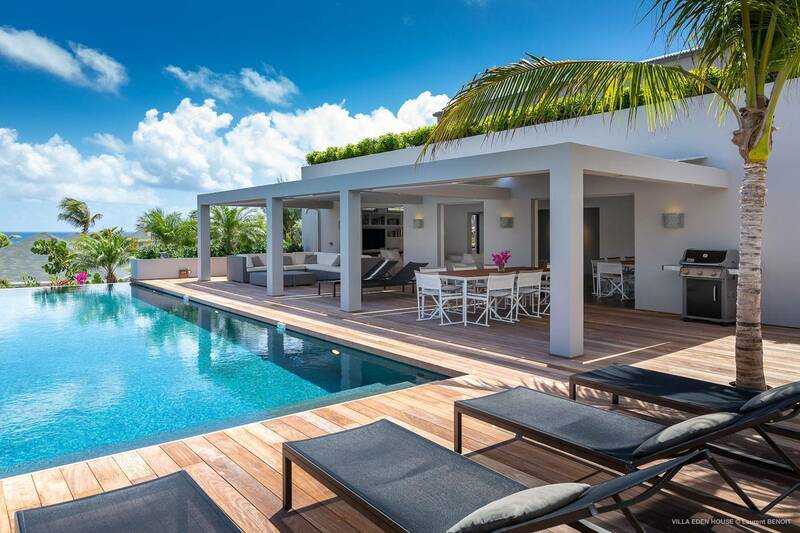 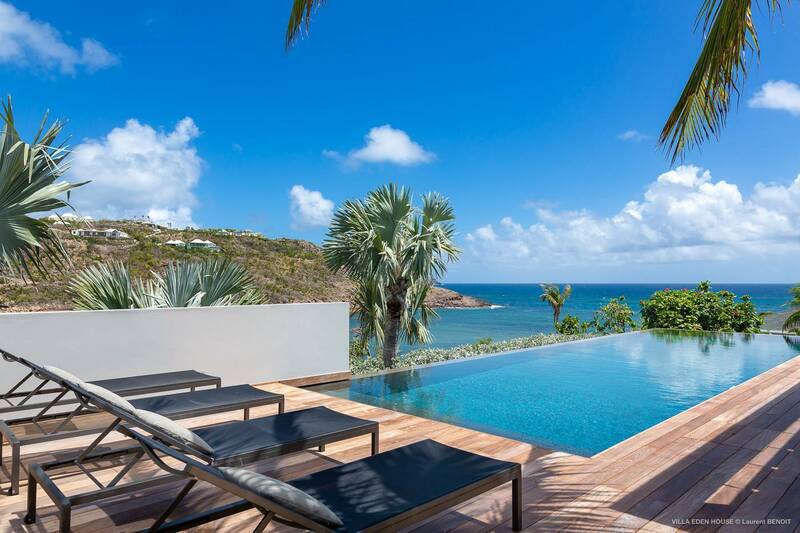 Chic contemporary villa, minimalist décor; 3 equally sized en suite bedrooms and a gourmet kitchen. 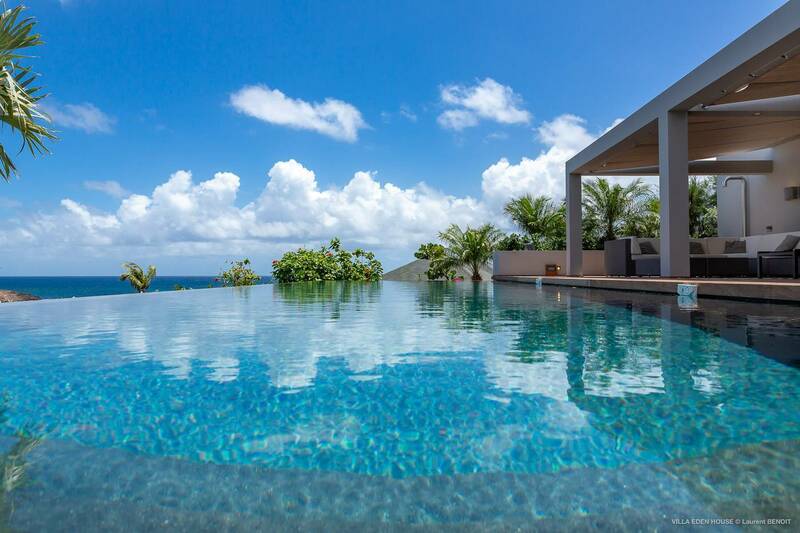 An oversized infinity pool graces a huge deck.